ReMix Asian Kitchen has done it again, adding another tasty lunch option. The ramen, with traditional tonkotsu broth, is a filling meal with fresh noodles, home-made stock and chashu pork roasted in house. 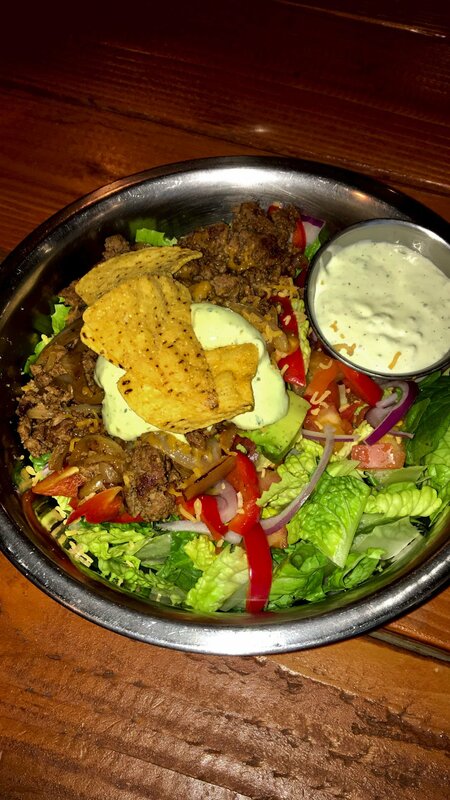 The Bejarano salad at New Vintage Grill. Local plant-based business We Be Grubbin' serves up options like this fried chik'n meal with collard greens and mac and cheese. The Spicy Americano pizza at Milan's Market, the mobile business that operates Sundays at the Haggin Oaks farmers market and other spots during the week. Potato-leek soup is served Wednesdays and Fridays at Locale Farm To Table Eatery in downtown Bakersfield. Although we continue to enjoy the arrival of new restaurants, like Aqui es Texcoco and Viceroy, the big local food headlines last month were on restaurant closures. This isn't the health inspection temporary situation but the shuttering of longtime businesses that helped form our culinary landscape. The most notable was the closing trio of Mexican restaurants: Mexicali West in December, and Sinaloa Mexican Restaurant and La Colonia last month. All had been in operation for decades and their departure prompted a lot of discussion on social media, as well as news stories. That online chatter is what inspired this column. For as people inundated Facebook with responses like "I remember going there as a child" or "that's such a loss to the local dining scene," it also became clear that for at least a good portion of those people, those restaurants had been part of their past or a static fixture of the culinary landscape. Sure, that was the spot your parents took you to on Sundays but were you taking your children? Yes, what will become of the space once home to the dining establishment, but were you concerned about that before it closed? It's not a completely black-and-white issue — customers were still flocking to Mexicali on California Avenue up until the closing day — but it's an important reminder of what every person who dines in Bakersfield should do: Support local. No, this isn't an attack on chains. Bakersfield will always love its chain restaurants, as Red Lobster and Olive Garden aficionados can attest. But for all of those mom-and-pop and slightly larger but still small businesses, they need your dollars too. Don't wait to read in the newspaper — and yes, you should support journalists, too — that a place is closing. Go out and take the family or your gal pals or set a date night and patronize these local restaurants. Covering local food news means dining out often, even if it's take-out. And while some of those meals are fast food (when deadlines loom), many are from the exciting local spots doing their part to stand out in a robust dining scene. ReMix Asian Kitchen (9450 Stockdale Highway): I have yet to make it through all the items I intend to order at this great fusion spot nestled in among medical buildings near Stockdale and Calloway. I did try the new ramen, with a traditional tonkotsu-style broth featuring home-made stock, chashu pork roasted in house and fresh noodles. Along with a fish cake, green onions and medium boiled egg, the toppings included roasted tomato, which added a great pop of umami. I would gladly trade the egg for a few more tomatoes. Owner and chef Sung Suh said they plan to expand their ramen offerings later in the year. New Vintage Grill (9901 Hageman Road, Suite 100): I've heard this northwest spot has a great brunch scene but I've only been for lunch. The Bejarano salad is a classier version of my home-made taco salad and it's nice to have someone else do all the veggie prep on that. The spicy jalapeno soup is also one of the best soups I've had in town. We Be Grubbin' (vendor at Sunday Haggin Oaks farmers market, 8800 Ming Ave.; webegrubbin.com): Their Thai crunch salad is in my top five local salads. As much as it would be great for Kim and Shanta Jackson to have a brick-and-mortar, it's still fun to catch them at the market or get a weekday delivery from their service. Plant-based options including fried chick'n, collard greens that won't have you missing the ham and a mushroom-onion-black bean veggie burger. Milan's Market (vendor at Sunday Haggin Oaks farmers market, 8800 Ming Ave.): As much as I enjoy my fast-casual pizza spots, it's worth the slightly longer wait for the wood-fired pizza (get the Spicy Americano) at this mobile operation. It's also expanding into some breakfast options and sandwiches, which I hope it will bring to the new Market on the Hill when that opens Feb. 9. Locale Farm to Table (1727 18th St.): Much like the updated address (it used to be at 1723A 18th St.), this restaurant keeps things fresh. Love the vegetarian Buffalo wings, Candace's sweet potatoes and Brussels sprouts and the beet salad (when it's available). Looking forward to trying the sweet collaborations with Bear Food Paleo and Prodonuts. Owner Heather Laganelli is an agent of change in the local dining scene and I'm all for it. These are just a few places I like (we don't have the newsprint for my full list). The takeaway is to find your own local eateries that you love and keep supporting them. Vote for your favorites in the Best of Kern poll or suggest new ones when it rolls around next year. (Note: Voting is open until Feb. 17 but the suggestion field is closed until the 2020 poll.) There are 35 categories in food/dining alone. Dine out, offer feedback (politely not a Yelp attack) when needed and show these restaurants you want them to stick around and establish their own storied past. Stefani Dias can be reached at 661-395-7488. Follow her on Twitter at @realstefanidias. Do you have a tip, question or recommendation on Bakersfield restaurants, trends or food news in general? Email thedish@bakersfield.com, and your input might wind up in a future column.